Established in 1986, Alpha Signs are a well known business offering excellent service. Proprietor, Robin Gell has had over 32 years experience of the Sign Business during which time the business has adapted to the many changing processes throughout the industry including computerisation and digital printing. These run alongside the many traditional services that Alpha Signs offer. Alpha Signs offer a vast range of signage for any size of company. Our goal is to offer the best possible service using the very best materials. This way our customers know that the product they buy will last for years to come. This is why Alpha Signs customers are so loyal. Whenever they need high quality products they return to the company they can rely on. Alpha Signs, your sign company North Yorkshire. Here is a list of our Portfolio. Traditional Village Entrance Signs, School Signs, Church Signs, Shop Fascias & Signs, Restaurant Signs, Pub Signs, Hotel Signs, Local Authority Signs, Police Signs, Van Lettering (Vinyl & Hand Painted), Commercial vehicle graphics, Van graphics, Painted Plastic Signs, Safety Signs, Holiday Park Signs, Camp Site Signs, Acrylic and Metal Lettering, Digitally Printed Banners, Engraved Plaques, Honours Boards and many more! Vinyl graphics and digital printing epitomise the way the industry has moved forward over the last twenty years or so. These are widely used to letter modern day vehicles, industrial signage and digitally printed banners, shop signs and fascias as an alternative to using the traditional hand painted method. Vinyl Graphics and Digital Printing Page. Quality library signs are a must for any library looking to create that professional look and feel to their premises. Quality library signs are very much called for these days. Alpha Signs have been supplying Library signs throughout the British Isles for the last three years. These Range from external entrance signs, individual lettering applied to walls and vinyl frosting on windows with imagery. This can be used on many other applications. For further details of Libray signs we offer go to our Library Signage Page. 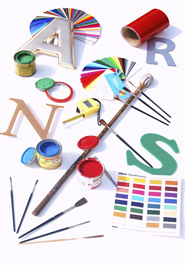 There is a growing demand for traditional signwriting and Alpha Signs in Thirsk, North Yorkshire are able to offer a wide variety of options available to choose from. Traditional hand painted signs are usually produced from wood and painted but can also be offered from painted plastic. They are hand signwritten using the original skills and techniques. Traditional Hand Painted Signs Page. Sign maker in Thirsk, North Yorkshire. A well established company based in Thirsk, North Yorkshire! Alpha Signs, Thirsk are a well established sign company that offer a large range of signage for all types of business applications. If you are looking for a sign company in Thirsk or a sign company in North Yorkshire please give us a call now on 01845 524810. Alpha Signage has a reputation for quality and longevity. Robin Gell has had over 32 years experience of the Sign Business during which time the company has adapted to the many changing processes throughout the industry. Computerisation and digital printing are examples. Alpha Signs also make Banners, bespoke signs and also offer engraving in Thirsk at the Alpha Signs Shop. Alpha Signs North Yorkshire is your one-stop shop for all your signage requirements. It's Alpha Signs aim to offer the best service, the best support and the best advice to all clients large or small. It is through doing this which creates recognised trust between us and you, the customer. Clients come back again and again for a trusted service. If you're looking for a trusted sign maker in Thirsk, look no further.